In the 15th century Europe begin to prosper and the countries grow strong. Gone are the internal strife, wars, crises, plagues and epidemics. The population increase and begin to migrate to the towns from the countryside. In the 16th century Europe casts its glance towards other lands and continents, over trading possibilities and new items to sell. 200 years later Europe is a world power.Europe’s political and economic growth forms the backdrop for whaling inSvalbard. It all began with Spain and Portugal as the leading seafaring nations in Europe. They found the sea route to The East and they reached The Americas. They had a monopoly on trade with these enormous and rich landmasses. In northwest Europe new seafaring nations were growing, such as England, Franceand The Netherlands. They wanted to get in onSpain and Portugal’s monopoly. The young seafaring nations competed for trade and markets. A northern sea route to the Orient would, perhaps, get them on track. A systematic exploration of the northern seas was set in motion. 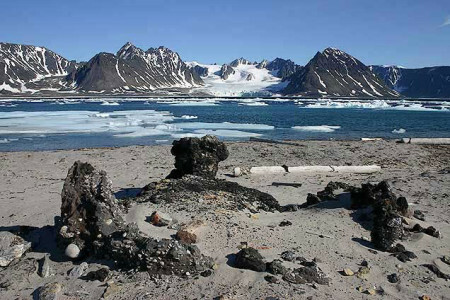 Svalbard was discovered by the Dutchman Barentsz in 1596. In the years afterwards there were reports of large numbers of whales, seals and walrus in the waters around the archipelago. At the same time the demand for whale and seal products increased in Europe. Europe needed oil. The seafaring nations had their eyes on the rich resources in the north and began to learn the art of whaling. The year 1612 marked the beginning of systematic whaling in Svalbard. Sailors from many nations came to the archipelago to investigate and harvest the natural resources. The dream of finding a sea passage to the Orient was still there but it was no longer the primary objective. Now it was Svalbard and whaling that counted. The whaling adventure in Svalbard is a tale of courageous and adventuresome men and their dreams of wealth. The everyday life was a life in blubber and oil with the hunting of whales, the flaying of whales and the boiling of blubber into oil. In Europe the oil was used in soap and for lighting, but also in the preparation of textiles and leather. The baleen was used in the corsets and sunshades. Whaling in Svalbard up to the middle of the 17th century took place near the coast and inside the fjords during the summer. The hunting was based around whaling stations on land where the whale blubber was boiled into oil in large copper boilers. In the beginning the land stations had a temporary feel with simple makeshift blubber cookers on the beach. The work took place in the open-air and the accommodation was in tents. Gradually several of the stations acquired a more permanent look with solid houses and workshops and brick-built try-works that could be re-used year after year. The ships that sailed north each year had between 4 and 6 small shallops that were used in the hunt actual. Each of these boats were crewed by 6 men. In the front of the boat sat the harpooner. Aft sat the mate and between these two 4 oarsmen operated. When the whale was sighted it was imperative to row up as close as possible. It was important to achieve a direct hit with the harpoon. Long lines were attached to the harpoon. These ran out at great speed as the whale dived under the surface after it was first hit. Martens (1671), describes this as a trip where Â‘the whale swims like a wind with the boat such that it whistles in the earsÂ’. It was vital that the line was able to run free. If the line were to shag the small boat could easily be dragged under. If the boat was not aligned to the direction of the whaleÂ’s flight it could easily be capsize. The chances for surviving in the ice-cold water were slight. Several small boats engaged in the hunt and would harpoon the whale in turn as it surfaced to breathe. In the end the whale would be exhausted from blood-loss and from dragging along all the small boats. The boats could then come in close to the leviathan, which was then finished off with lances. The whale was towed to the shore or to the side of the ship where the blubber-cutters cut off long strips of blubber with their knives. On land the strips of blubber were cut into smaller and smaller pieces on cutting-benches. Finally, it was placed in copper boilers on the try-works and boiled into oil. The boiling whale oil was cooled in large vessels filled with water, which, at the same time, removed the impurities from the oil. Afterwards the oil was to be poured into barrels and ferried out to the ship to be stored in anticipation of the end of the season and the homeward journey. From the middle of the 17th century the whales withdrew from the fjords and waters in the vicinity ofSvalbard. Whaling became concentrated on whaling ships out at sea and along the edge of the drift ice. The hunts in the open waters lead to changes and adaptations of equipment, boats and crew. The method of hunting the whales was the same as during the land-based hunt, but now the whales were killed in the open sea and were flensed alongside the ship. The blubber was either boiled into oil on board the ships or stored in barrels and taken back to the home port to be cooked into oil there. Whaling increased dramatically. Gradually it came to cover large parts of the Arctic waters and ships from most of the European seafaring nations. Many more took part than before. By the end of the 17th century there are probably 2-300 whaling ships and sealers out in the ice east of Greenland during the summer. Svalbard as tracts of land lost its importance. The old whaling stations went out of use and started its way towards ruins. The blubber cookers were torn down, the usable materials taken home and the tools removed. The tracts of land now functioned as harbour of refuge, rendezvous for the whaling ships on arrival and departure and as burial grounds. The burials of the men who lost their lives in the whaling during the 17th and 18th centuries are found many places in Svalbard. At the beginning of the 17th century large numbers of whales were reported in the waters aroundSvalbard. Captain Pool describes on his voyage to Svalbard in 1612 that the sea was so full of whales that it was almost necessary for the ship to break its way through. By the end of the 18th century it was all over. The stocks of Greenland right whale east and west of Greenland suffered a sad and fateful breakdown. Years of intense whaling had almost caused the extinction of the whale. The ships that travelled north for the hunt were returning home almost empty. The western European whaling adventure in the Arctic waters is over.